Pasta is probably my favorite thing in the whole world to eat. I can always pass on sweets, candy, cake, or soda - but pasta is a hard one for me. Of course, pasta is nothing but a carbohydrate wrapped in a carbohydrate - just my luck. It's literally the worst thing that you can eat, and yet, I'd give up one of my arms for a bowl of good pasta. So the prospect of giving up pasta breaks my heart. I needed an alternative. I bought a spiralizer and tried making zucchini noodles. My kids made for of me for "noodling vegetables," but I did it anyway. I fully expected to hate this. I took the first bite expecting to spit it out and gag. But I didn't. In fact, I thought it was good! I was very surprised. And, it was very easy to make, an my family still ate regular noodles. It was no biggie. The spaghetti sauce that I make takes no time at all, and everyone always says that it's the best spaghetti sauce ever. Honestly, it's not even from scratch - it's just a matter of using the right spices. 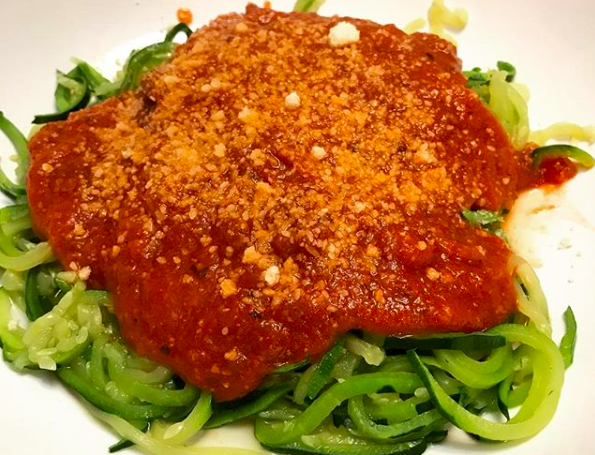 We eat spaghetti at least once a week and it is a crowd pleaser, but I have to ditch the pasta, so this zucchini noodle situation is going to be a big difference maker for me. The only thing you have to remember when cooking zucchini noodles is that zucchini has a very high water content, so when you introduce heat that water is going to try to escape from the zucchini, making the "noodles" soggy if you aren't careful. It is important to ensure that you aren't cooking the noodles too long. It is also helpful if you leave the skin on the zucchini. It will help to hold the moisture inside. There are a ton of different spiralizers on the market. There are automatic spiralizers, and ones with spinning handles - I am certain that they all work the same and achieve the same result. Mine is compact for easy storage, and dishwasher safe, so I am pleased with it. The best way to cook zucchini noodles is in a frying pan with a tablespoon of olive oil. Make sure that the pan is very hot before you introduce the noodles, and then keep them moving. It should only take 3-5 minutes for them to cook. They will look uncooked - trust me, they are cooked. If you leave them until they "look" cooked, you will find that you have nothing but a puddle of water with some zucchini floating in it. After you cook your noodles, drop 'em in a bowl with a little sauce and enjoy! I personally did not miss my usual pasta and felt satisfied. 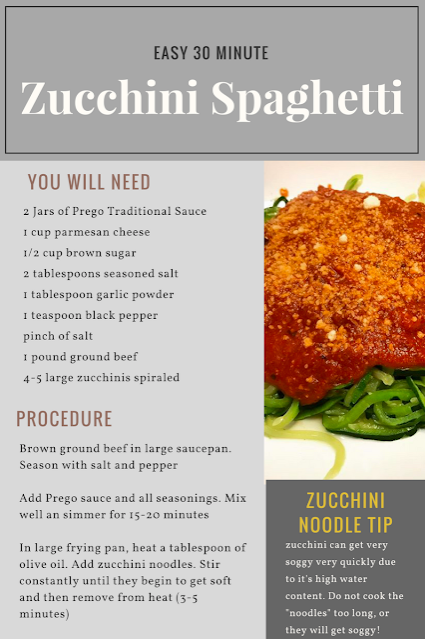 This is a wonderful alternative, and I am looking forward to making it a routine on spaghetti night.